Starring Philip Seymour Hoffman, Catherine Keener, Clifton Collins Jr. The film that gave the legendary Philip Seymour Hoffman his Oscar, the true story of Truman Capote’s In Cold Blood is definitely an interesting one. This is a very slow, almost poetic film brought to life by one of the finest actors of his generation. 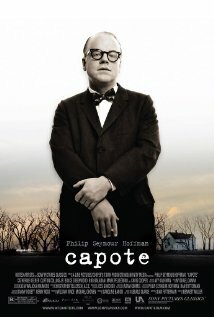 Capote stars Hoffman as Truman Capote – a posh, rich and famous writer for the New Yorker. Capote hears about the murder of a helpless family of four in Kansas and is compelled to write an article about it. He is compelled by the story and looks to turn it into his latest book, titled ‘In Cold Blood’. For help with the piece, he starts to interview everyone affected by the murder, and develops a strong relationship with Perry Smith, one of the murderers responsible who is now sentenced to death. The true story is quite interesting, but what this film wants to focus on is the emotion felt by Capote, and the relationship he develops with Perry Smith. The story of the murders and the book is just so the film can follow some sort of line while it delves into the mind of Capote to try to understand who he really is. If you watch this out of interest of the story, like I did, then you can find yourself waiting for a while for it to develop. This is a very slow film, and for me it felt a lot longer than the under 114 minute runtime. Capote is a very artistic film, hence the catalogue of Oscar nominations, so if you’re thinking of watching this out of curiosity for the story, you better be ready to invest in the characters too! The acting in this film is very strong, led by a great performance by Hoffman. Capote is such a complex character with many emotions going on all at the same time, but Hoffman portrays them all with such ease that you can really buy into the character and start to understand who he really is. What gets you at the beginning is the accent. Now, I don’t know what the real Capote sounds like so I don’t know how accurate it is, but Hoffman’s voice is so different that straight away you’re in awe, just because of how strong and believable that voice is! he also keeps it up almost faultlessly throughout the entire film, and that has to be applauded. Hoffman’s performance shouldn’t overshadow what was two very real, very good showings by Catherine Keener – playing Capote’s trusted assistant – and Clifton Collins Jr., playing the death-bound murderer desperate for compassion. The directing by Bennett Miller – whose more recent works include sports movies Moneyball and Foxcatcher – definitely brings a strong art flavour to this film. There is many still, photogenic shots especially early on that almost reminded me of Jonathan Glazer’s work in Under the Skin. His work with the camera leads the idea that this film is about the emotion of Capote, and for him to do too much with the camera would take away from the feel of the piece – therefore he doesn’t really have to do too much, just make sure that the right emotion is being portrayed through the camera, and he does a good job of that. All in all, while this isn’t really my style of film and I probably won’t watch it again, I can appreciate the artistry that has gone into making this. Miller is a great director whose style is visible in this and in his more recent works, and Hoffman is fully deserved of the Oscar for his work in this. Ever wanted to write film reviews? We’re looking for weekly contributors! Click here for more.